Last to Die was my first Tess Gerritsen novel. It is a story of pursuit and rescue, of outsiders and insiders. Our entry into the story is thru Teddy Clock, whose family is massacred. He (and others) are rescued by the mysterious blonde who says "if you want to live." Boston police detective Jane Rizzoli has his case, and takes him to the Evensong boarding school in Maine, where many strange and damaged orphaned children are sequestered in protective custody in the wilderness. Medical examiner Maura Isles and Detective Jane Rizzoli make it their business to protect the orphans. Something is after them. Fans of the television series Rizzoli and Isles will recognize the characters to some degree; but Jane and Maura's lives take a different turn in the books than they do on the screen. If I had never seen the television series, I would have visualized the book differently, I think, even though I read the books first, and discovered the series later. I found the writing to be very serious, as compared to someone like, say, the entertaining Janet Evanovich, but infinitely more relatable than Kathy Reichs Bones series. No puff and fluff here, but chilling to the bone. 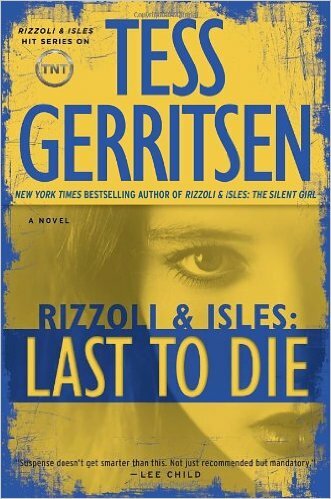 Tess Gerritsen's knowledge as a doctor is intrinsic to the content of the book, and the content of Maura Isles personality, but the author's love of mystery and puzzle solving comes out as well. If you want a book that talks down to you, and that spoonfeeds you the story, Gerritsen's stories are not for you. If you love writing that respects you as a reader, and presents challenging stories and well rounded characters carved as sharply and clearly as a doctor's scalpel, then you will love Gerritsen's work as I do, though it might come with some nightmares.